Like everyone else, I was horrified by the sight of Notre Dame in flames on Monday evening’s TV news. It is almost a decade since our last visit to Paris, which was to mark our wedding anniversary, and naturally Notre Dame was on our places to visit list. Paris is a very beautiful city and this cathedral is just one of its many masterpieces. Once the fires were put out, I’m sure that like me, you were relieved that much of Notre Dame’s fabric had survived and that many of its treasures were saved. Above all, we should celebrate the fact that there was no loss of life due to the blaze, and although it may take decades to restore, what has been lost can be rebuilt. I was deeply moved by the sight of Parisians singing Ave Maria as the cathedral burned and can well understand their sense of loss. Almost immediately, breathtakingly large donations poured in. The last time I looked, nearly a billion Euros had been pledged, mainly it seems from billionaires, for the reconstruction work. Whilst I too hope that the building will one day be restored to its former glory, I must admit to finding this eagerness to help by the super wealthy, left me feeling ever-so-slightly bemused. I am immediately reminded of the fire at Grenfell Tower, London in 2017, which took seventy-one lives. In the many months since about 27 million pounds has been raised. This money has been received from small personal donations, to help the traumatised survivors, who are mostly low-income individuals - no vast billionaire pledges seen here, it would seem! And before you think it - no, I’m not writing a rant about the hypocrisy of the wealthy. I think this is something we should all be paying our attention to - asking ourselves questions like, “what do we truly value?” and “which items in life can be labelled ‘priceless’ and why?”. We live at a time when it is estimated that something on a scale of 150- 200 species of plant, animal, bird and insect might be becoming extinct every single day. The WWF says that nothing on this scale has happened in our planet’s history since the dinosaurs, and that unlike the causes for the previous extinctions, one species is solely responsible - namely, us! In 2018 the world’s leading climate scientists warned that there are only a dozen years left before we see irrevocable climate breakdown. The forecasts for our pollinator insects over the next hundred years, which we rely on for the food on our plates, look utterly dire. We are told by experts time and time again that fossil fuels are to blame and must remain in the ground and that we must develop renewable systems at a faster rate. In the UK we have the most backward-looking government I recall experiencing over my entire lifetime - they think fracking is a jolly good thing, and that most of the stuff to do with renewable energy and ‘green issues’ are just ‘Lefty nonsense’. They seem to think that providing bottle banks and banning free plastic bags in supermarkets is radical change. Are they serious, if so, possibly a bit Tim Nice-but-Dim, or are they simply disingenuous? I’ll let you, the reader of this blog post, decide the answer to that one. So what are the objects we consider to be of the highest value, and which items do we meet in life and label ‘priceless’? I’d list my baby granddaughters, my wife, my son, our family and friends; then the people in my community who I don’t know personally but who I greet on the pavement; those people who have at times materialised as if from nowhere to lend a hand in a time of need. I guess the same list would apply to just about every person in the world, I expect we all have someone we love and friends we like. Most of us just want to be happy and enjoy our lives with our friends and families. Yet we seem to suffer from collective amnesia when it comes to climate breakdown and the ticking clock - just eleven years left! We mourn the destruction of a great cathedral but what about the cathedral that is nature? Shouldn’t we be in mourning for the creatures and plants that become extinct each day? Notre Dame can be repaired after just a few decades, but the world we’re leaving for our children and their children will take our planet several million years to recover from. I told someone recently that I was considering adopting a plant-based diet as part of a (small) personal contribution to the fight against climate change. Their reply shocked me. They said that as they had no children or grandchildren they saw no reason to amend their behaviour in any way. Whilst I’m sure that person is not unique for holding such views, I sincerely hope they are not shared by the majority, if so, then Eckhart Tolle is right when he declares in The Power of Now that the human race is suffering from mass insanity. I am glad that Notre Dame will be rebuilt, it is a wonderful sight to behold, and Paris just wouldn’t be the same without it, but at the end of the day, it is just a beautiful building. Let's spare a thought for the miracle that is the great barrier reef and its coral eco-system dying because of pollution, or the rain forest being systematically destroyed for logging, soya and palm oil. I’d say that the unpolluted earth, the air we breathe, the water we drink, and the people, plants, birds, fish and animals that populate it are our most priceless assets. As a species we seem to get confused over and over again about the difference between cost and value. 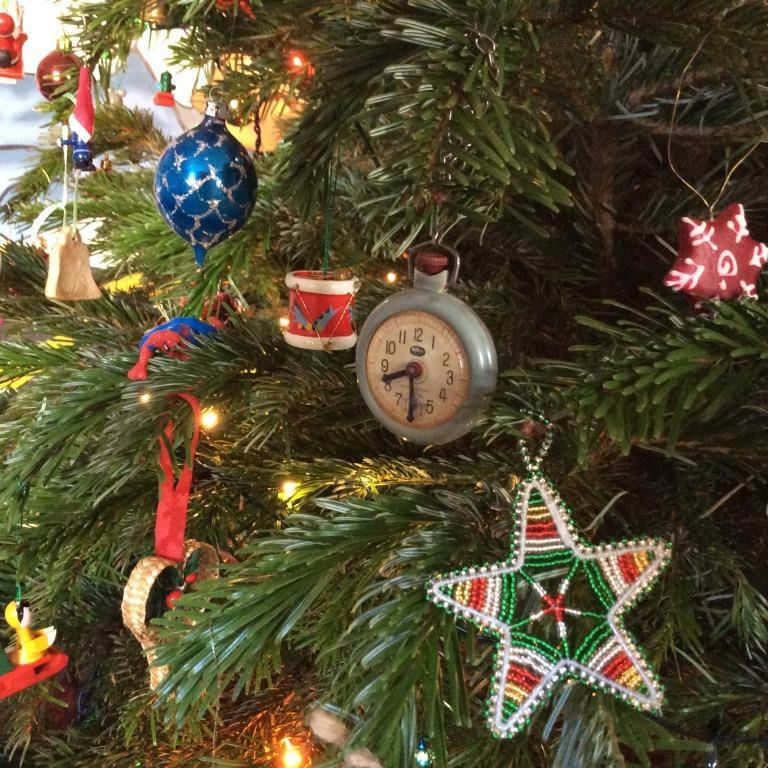 Twixmas Offer: Less Than Half Price! The Art of Creative Collaboration - a family business! ​I was asked recently if I’d like to write six hundred words for one of our local newspapers about my new title Wilhelm & Laszlo and its precursor Niedermayer & Hart. These two form the first two instalments in what will eventually become a trilogy (no overall title yet!). The link to the The Times of Tunbridge Wells article, if anyone would like to read it, is at the bottom of this blog piece. When I first published Niedermayer & Hart, although I had always visualised it as the first part in a trilogy with a fully complete and rounded story arc, I brought it out as a standalone piece. This was primarily because, as a newcomer to the writing game then, I didn’t want to commit to something I knew would take up many more months of work before first receiving some feedback from readers/reviewers etc. - I thought I’d dip a toe into the pond before committing myself to full body immersion. Once, however, Wilhelm & Laszlo was ready to publish, we (‘we’ being the production team at Odd Dog Press, wife and editor-in-chief Judith Johnson, son and cover designer, artist Tom Johnson) felt both the book covers needed to be more informative about content - the original front cover of N&H gave very little away, and unless you flipped over to read the blurb (not possible on Kindle) and saw the bloody fingerprint depicted on the name-card there, a prospective reader might have thought they were about to begin a work of historical fiction, or gothic romance perhaps? So these were the main motivators behind the new-look for Niedermayer & Hart. 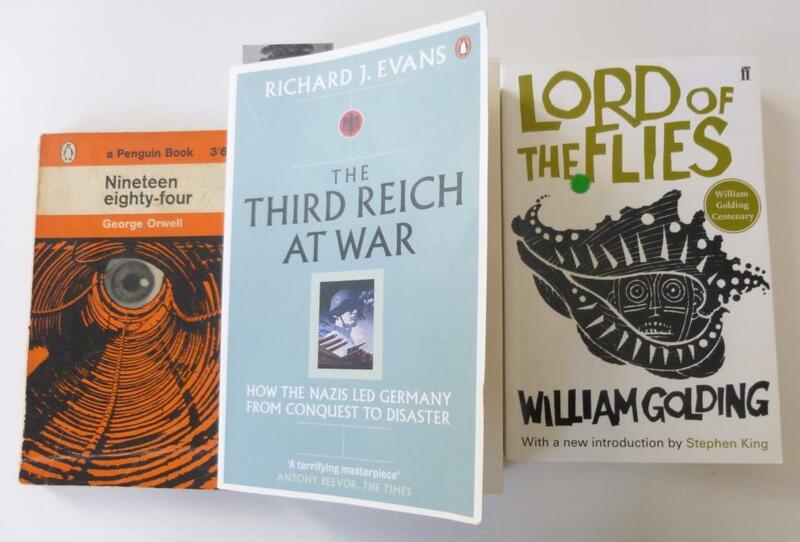 Firstly, to guide and inform the reader more accurately about content, and secondly to create a ‘brand’ look and feel that might be applied just as effectively to the first two books, as well as to the planned final part of the trilogy. We had numerous discussions over many months of possible themes, at first thinking to portray an inanimate object like the ruins of Valle Crucis Abbey (as depicted on the first edition of N & H) on each cover. Over time however, the concept changed and it was agreed we should try and hint at something contained within the books themselves, and that this was probably best achieved through its cast of characters. The amount of art work involved in creating both covers was enormous. Tom is a very busy man and he generously gave what little spare time he had to the project, never once stinting on or suggesting corner-cutting if more work was required. I am a proud and grateful father. There were times when we found ourselves wandering down a few blind-alleyways before we could finally agree as a production team that everything was exactly how we wished it to be. The books (8.5”x 5.5”) required Tom to complete five intricately detailed much larger pieces of art work (see photograph) in oils on paper, which he scanned into a computer before sizing, ordering and arranging them with text etc. The printed books are simply a delight to behold (okay, I’ll admit to a little bias here!). And although reviews are slow to appear as yet - an eternal problem for independent authors - feedback I’m hearing via email/twitter etc. from readers is very positive on the content front too. So, phew! I loved the old N & H cover and I simply adore the new artwork for the trilogy. I hope you agree. 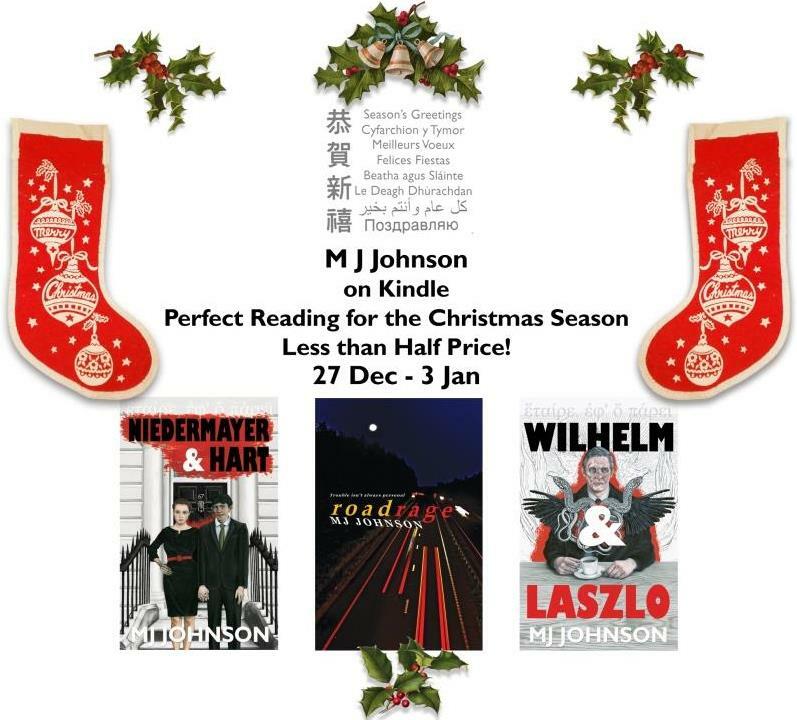 Niedermayer & Hart and Wilhelm & Laszlo are both available through Amazon as ebooks and in printed versions. Click this link to see more of Tom Johnson’s artwork. Click link to read the article described above from The Times of Tunbridge Wells. 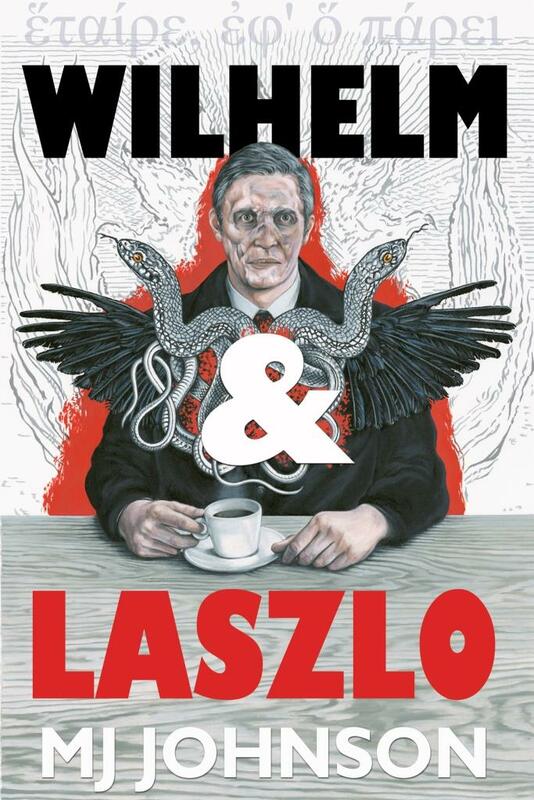 I am delighted to announce the publication of Wilhelm & Laszlo. It is the follow-on book to Niedermayer & Hart, the cover of which has also profited from a re-design. The books both look fabulous with their newly branded covers. 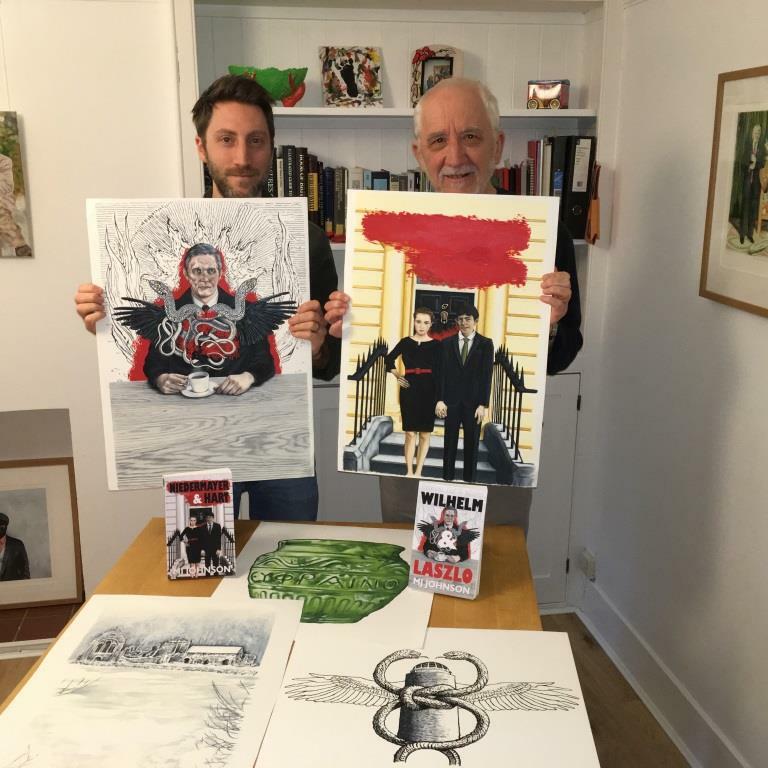 These were designed by the hugely talented Tom Johnson, which not only enables me to crow about the wonderful artwork that introduces the first two titles in my supernatural/thriller trilogy, but also as his proud father. The whole endeavour has been an inside job, with my wife Judith providing her support since the completion of Wilhelm & Laszlo’s second draft (the point at which I allow her to view new work) as unpaid editor. I also called on the knowledge and expertise of a number of friends for help. I must choose my friends wisely, because everyone approached not only said yes immediately, but never once complained about the task (least not to me!). Some of these good people must have spent hours at work on the book’s behalf and for this I am indebted to them. I am not going to produce a list here, but they are all named in the book’s acknowledgements. I should also mention fans of Niedermayer & Hart (and Roadrage) who have always kept faith with the project despite some lengthy delays at times. In this second part of the trilogy which began with Niedermayer & Hart, the story once again unfolds within two time frames. The Guardians under Aref’s leadership reach Albi, where de Frontignac and his crew soon gather, intending to steal that which the Guardians have striven long and hard to protect. While Jim Latimer and his friends mistakenly believe that the Niedermayer & Hart affair is concluded, three thousand miles away in Newark, New Jersey, a number of fresh corpses are discovered, all minus their heads and hearts. A new foe emerges, highly organised, corrupt, powerful, able to spread its influence widely. The choice that remains for Latimer and co. is stark: take the fight to the enemy, or perish. Having gained the confidence of readers with the first title, they will hopefully deem me capable of once again dovetailing two seemingly disparate sagas. Overall, I am happy with the new book; it continues the story where the first one leaves off, but may see its readers a mite baffled and intrigued for a while. I hope it works as effectively as Niedermayer & Hart appears to have done for the majority of its readership, and for those who are yet to discover the series, that it will become a thrilling experience. My thanks once again to everyone who assisted me, whether it was by proof-reading, editing, advising, or just casual readers who discovered the book by chance and took the trouble to post an honest review, or supporters on social media like Facebook and Twitter. Believe me, as an indie author with a marketing budget that’s pretty close to non-existent, every little bit helps. ​Our first edition of Niedermayer & Hart (published in April 2012, copies still available) was airport-exclusive size and priced at £12.99. We'd always wanted to offer our readers print books produced to a high spec, but at a more affordable price, and we are therefore pleased to announce that the new edition, physically a bit smaller at 8.5 x 5.5 inches, retails at just £8.99 ($12.95). 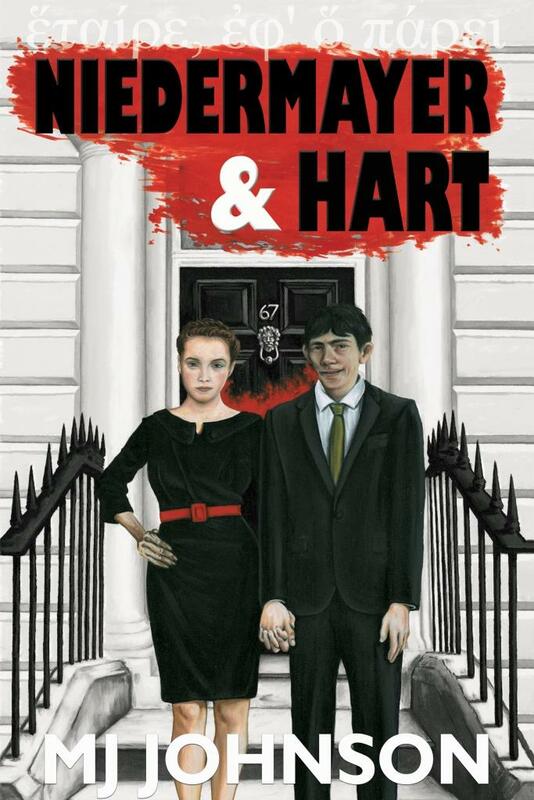 As promised in my last blog, I’m taking this opportunity to unveil the new cover for Niedermayer & Hart. I'd always had plots in mind for three stories, however, I wanted to be certain that the first book was received well before committing myself to writing the other parts of the trilogy. Wilhelm & Laszlo is the resulting sequel. I am fortunate to have a son, Tom Johnson, who is an accomplished artist, and has generously donated many hours of his valuable time to the task of creating two fantastic new covers. They are essentially portraits in oils, and I am assured by a graphic designer I know, that such cover designs would be considered too costly to produce these days by any mainstream publishing house. I'll be releasing the first pictures of the Wilhelm & Laszlo cover in a few days’ time, once it's actively published. The covers for both new editions are unmistakably creepy, at least we hope so! The Kindle versions naturally share the same front covers with their printed brethren. Although I’m a fan of Kindle, it still lends an added thrill (I'm sure many book lovers will agree) to hold a new paperback, and turn it over to scan the blurb. So there you have it: re-branded, with two eye-catching covers! Believe me, it took some gnashing of teeth, a lot of head-scratching, patience and a fair amount of going back to the drawing-board before we achieved the look and feel we were after. I look forward to receiving your feedback in the weeks and months to come, but personally speaking, as far as the covers are concerned, we've ticked everything on our list. Honestly, just take a look at the book cover above, and tell me you don't want to know what's lurking behind that door at number sixty-seven? Be warned though, whilst reading this book some readers have admitted they needed to put the light on when making trips to the loo at night, others have opted to only read during daylight hours. Fortunately, all survived and more importantly (from a partisan viewpoint) lived long enough to leave a favourable review! I mentioned in my previous post that I would be doing promos leading up to the publication of Wilhelm & Laszlo. 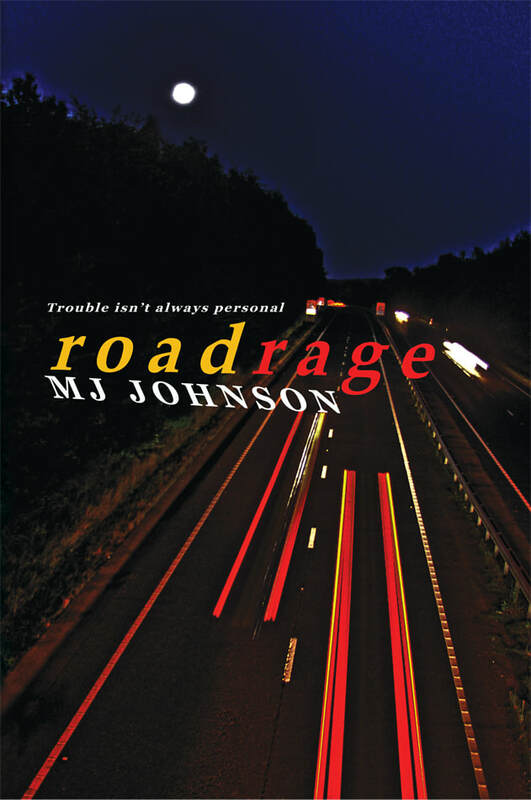 For the past week, my psychological thriller Roadrage has been available at a vastly reduced price on Kindle - if you're partial to nice people being plunged into disturbingly credible, deeply unsettling predicaments, then hurry, because the offer ends at midnight on Friday 27th! See links below. From today, Niedermayer & Hart will also be available on Kindle at 99p in the UK, or $0.99 for US readers, and this offer will run until just before midnight on 31 October (Halloween, yay!). The book has achieved a lot of excellent reviews on the Amazon sites and continues to maintain a high rating on Goodreads etc. ​I'm doing some promos leading up to the publication of my new title. 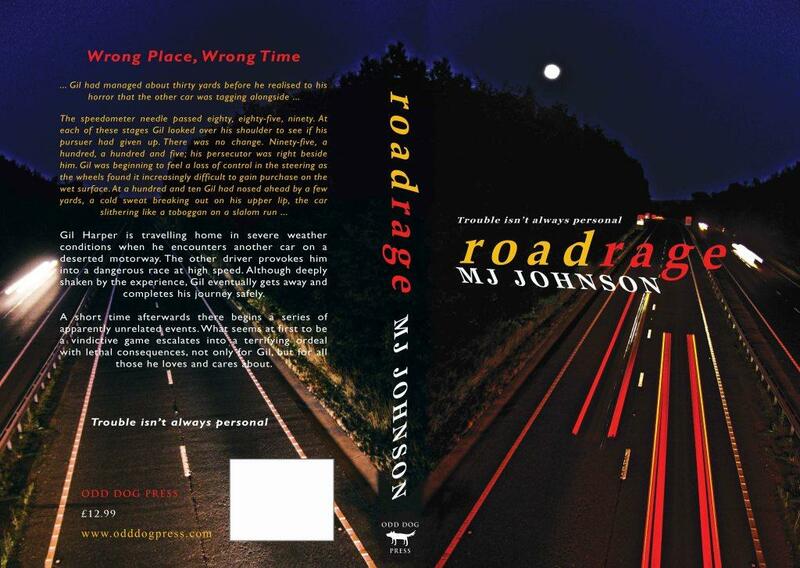 First off, for the next few days, anyone with a taste for psychological thrillers can download a Kindle copy of Roadrage at a significantly reduced price (link at the bottom of this blog). It’s managed to retain 4.04 on Goodreads after sixty-eight reviews/ratings, and there are more reviews available on the Amazon sites. You have until Saturday 27th October to purchase a Kindle copy for 99p in the UK, or $0.99 if you’re in the United States. The book is normally priced at £3.99 and $4.95 on Kindle, so it’s a genuinely good offer. This promo will overlap with the arrival of a new print edition of Niedermayer & Hart (a new Kindle version will be available simultaneously, and for a short time, this too will be at a reduced price), which I’m bringing out to precede the publication of its follow-on title. I’m really pleased that we’ve also been able to achieve a better price for readers at £8.99 and $12.95. We’ve been working really hard at Odd Dog Press, and the covers for both books beautifully complement each other. The aim has been to create an instantly identifiable ‘brand’ for these two books, which are the first and second parts of a trilogy. The art-work is exquisite. I’m looking at the proof copy of Niedermayer & Hart as I write this blog, which only arrived in the post yesterday, and I am over the moon with the results. I’ll be posting the first pictures of the covers shortly. 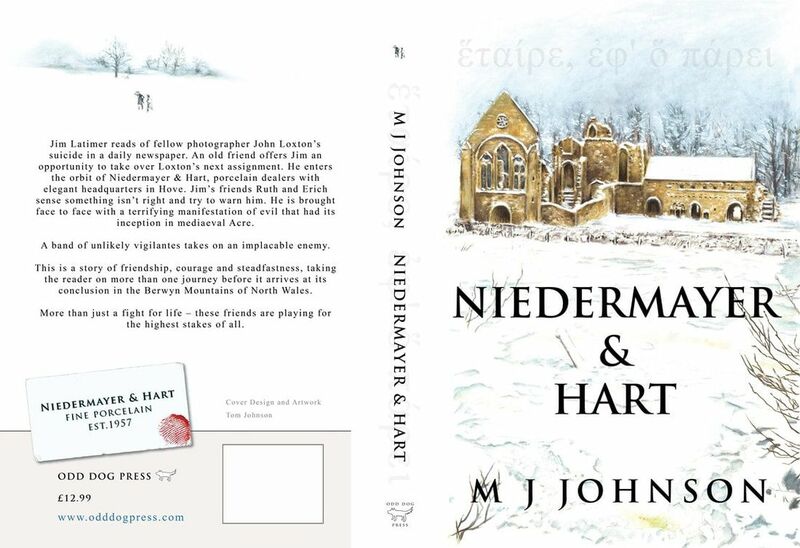 Don’t get me wrong, there was nothing wrong with the original cover of Niedermayer & Hart (which also remains available while stocks last), in fact, numerous people have written to me expressing their appreciation for its artwork. However, we felt it didn’t really give potential readers quite enough information, and may even have misled some people into thinking it was historical romance of some kind, Gott in Himmel! These exciting covers were created for me by my talented son, Tom Johnson. The new ebook and paperback of Niedermayer & Hart will also include a sneak preview of the prologue to its sequel. Finally, in just under two weeks’ time, hopefully coinciding with Halloween, my new title Wilhelm & Laszlo will be published. If you read Niedermayer & Hart recently, or have an astounding memory, then you'll have an inkling of the direction things are going in the sequel. If it’s a while since you read it and can’t remember, then there’s still time to brush up! And any newcomers to this unsettling little world, can soon download a Kindle copy at the offer price for little more than the price of a postage stamp. Niedermayer & Hart - "What's not to love?" If you're a fan of horror thrillers, or if you enjoy a ripping yarn, why not invest 99p ($0.99) in a kindle copy of Niedermayer & Hart, (normal price being $3.99). The title is on offer for the next few days. Niedermayer & Hart is the first part of a trilogy and its second book will be arriving in the next few weeks. Page Turning And A Surprise Around Every Page, What's Not To Love? A real rip snorter of a page turner. I don't normally read anything other than Stephen King (I'm a bit of a King snob and generally find other Sci fi / horror authors don't quite meet the grade) but Johnson has written what I love to read. Looking forward to reading more of his books.